So you want to employ wireless charging on your Moto Z device? Well, here's a piece of bad news. Right out of the box, you cannot use wireless charging on any Moto Z phone. But wait, what about the sequels? After all, the Moto Z2 Play is now available. BRRRP! Sorry, there still is no wireless charging feature on the Moto Z or Moto Z2 line that comes out of the box. But if you're willing to shell out a few extra bucks, there is a way to employ wireless charging on your Moto Z or Moto Z2 device. For $39.99, you can buy the "Moto Style Shell + Wireless Charging" mod. Attach it to the back of your Moto Z or Moto Z2 phone, and you will have a device that works with Qi and PMA pads supporting 10W charging. They are thin, adding just 3.25mm of girth to your device, and four color options are available. 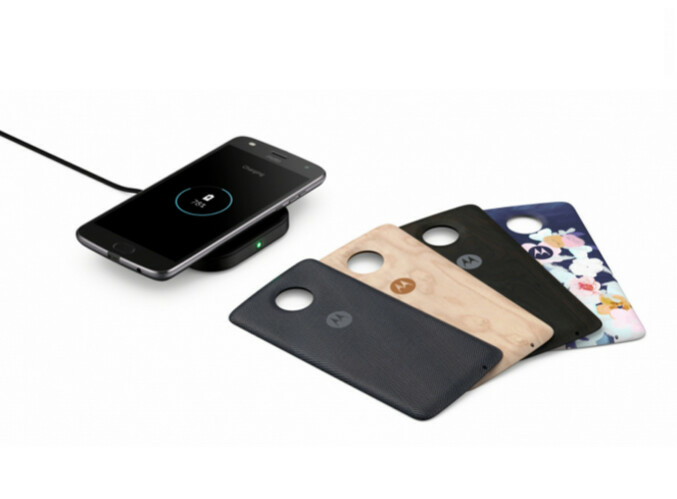 If you're interested in using wireless charging for your Moto Z handset, click on the sourcelink below to head to Moto's website. The wireless charging modular accessory (actually, all of the Moto Mod accessories) will work on any Moto Z or Moto Z2 model. I would probably consider this phone if it had wireless charging out of the box. Did you not read the article? You can get a shell that enables it. Maybe I don't want a shell to enable it...maybe I'd prefer the feature to be built in like it is on my Nexus 6. Just get the battery with wireless charging. This was the first Moto Mod I bought and the one I use the most. The pix 2 should've went this way (Mods). Very useful for people who have different priority on phones..